Students in these schools are now studying in dry classrooms with good ventilation, strong desks, latrines and rain collection systems. We must move forward, however, because there are still many thatch and mud, and deteriorated tin and brick schools. Please donate for the construction and equipping of another school. Also, please ask your Mission team, local businesses or a foundation to contribute. 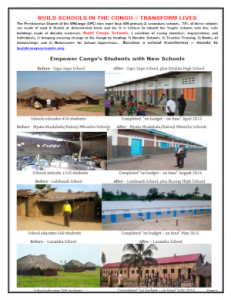 The brochure below can be printed and distributed to show the extreme needs of the Congo’s students and their schools. 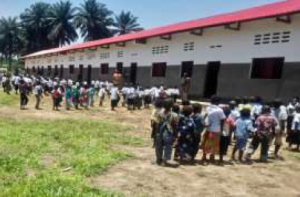 Go to buildcongoschools.org to donate, or to sull1300@comcast.net for more information. Thank you. Previous Post Save the Date for the 2018 Congo Mission Network Conference!